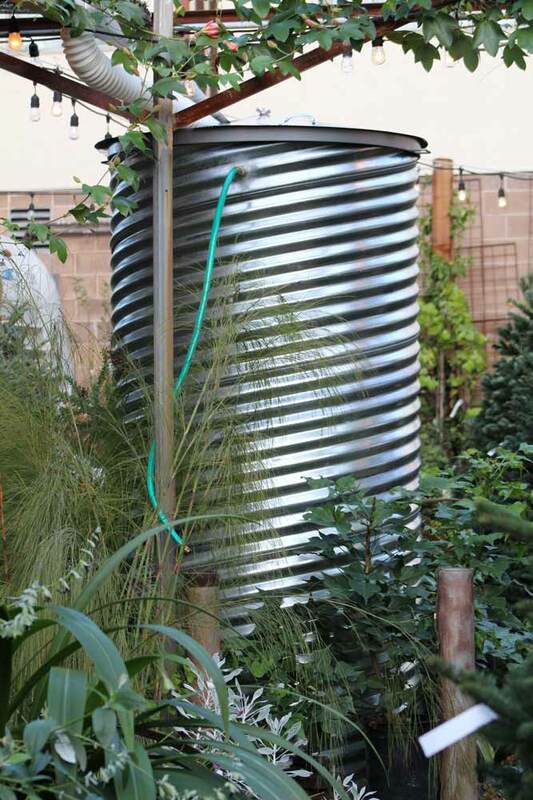 Permanent rainwater catchment tanks made from galvanized corrugated steel culvert pipes planted in 10" concrete slabs, retrofitted with a galvanized overflow pipe at the top and a valve at the bottom. The top of the tank is fitted with an expanded metal interior filter cone with bug screen filter, a 100% wool felt debris filter, and a galvanized conical lid with steel wingnut hold. The durable galvanized steel construction guarantees that these water tanks are safe, and non-leeching. They are a reliable long term investment for homes, schools, and commercial buildings already equipped with gutters and downspouts. Scroll down to view images of the tank in action and read about the project. Dimensions (Pictured): 42"(Diameter) x 8'(H), 500 gallon capacity. Custom sizes available upon request - larger/taller tanks available. Since my first visits to Northern California in the late 1980’s, I’ve developed a growing passion for solutions to the fresh water shortages that we face here and in many parts of the world as a result of drought, global climate change, pollution, and overpopulation. For decades I’ve watched the battles between Sacramento Delta fishermen and central valley farmers, between SoCal sod lovers and swimming pool owners and NorCal cannabis growers, and during that time we’ve all watched California's water tables drop dramatically. With few practical and mutually agreeable solutions on the table, it’s become clear to me that we are overlooking an incredibly valuable resource - Rain! Here in Berkeley we have no central water source, so the majority of our tap water travels 108 miles to reach us from the Mokelumne River in the Sierra Foothills. This massive movement of water is costly and prone to failures. I believe that now is the time to focus on small scale self sufficiency and local sourcing rather than wholesale dependency on government. Rainwater catchment on a municipal level can help us accomplish this, while also supporting our city sewer systems in times of heavy rain by minimizing neighborhood flooding and reducing the amount of sewage spilling into the Bay and the Pacific Ocean. Enormous amounts of fresh water come off of our roofs every time it rains. For every 1" of rain that falls on a 1000 square foot bungalow roof, 650 gallons of water flow through the downspouts. In Berkeley, we get an average of 24 inches of rain every year, just a little more than the average yearly rainfall in California, which means that every 1000 square foot roof will catch 13,000 gallons of water per year! The 500 gallon water tank we recently installed at the Flowerland Nursery in Albany, CA (pictured) filled in six hours of steady rain, erasing 500 gallons of water from the businesses’ monthly utility bill and leaving as much water remaining in our taxed reservoirs and watertables. Though not potable, rainwater can be used immediately for watering gardens, lawns, and landscaping, and, with the help of simple pressurizing pumps and filters, can be used to wash cars and driveways. Water catchment systems can even be hooked into plumbing to flush toilets, take showers, water house plants, wash dishes, and run washing machines and dishwashers. For reference, the average family of 3 uses 3500 gallons of water/year for toilet flushing, 4500 gallons of water/year to run a water efficient washing machine, and just 450 gallons of water/year for their water efficient dishwasher. So a Berkeley family with a 1000 square foot roof can easily catch all of the water needed to flush toilets, do laundry, and wash dishes, with more left over for watering gardens! Filling your own tank of free rainwater comes with a feeling of independence and self-reliance that is incredibly liberating. For anyone deterred from home gardening by fears of high water bills, a rainwater tank can seriously mitigate costs, thus increasing the capacity of families and communities to grow their own food. And now that Cannabis, which requires 6 gallons of water per plant per day, is legal in California, the installation of inexpensive water tanks can allow home cannabis growers and businesses to save significant money on their water bills. More good news - we already have the infrastructure for rainwater catchment in our communities - all of our roofs are equipped with gutters and downspouts, ready and waiting for water storage tanks. It's clear that installing rainwater catchment systems in our communities will have a big impact on municipal water supplies in California and other drought prone areas. Plus, the more water we keep out of our streets, the less we have to worry about rainwater runoff polluting our oceans and contributing to sea level rise. AND YOUR PLANTS WILL LOVE IT! Most of us water our gardens with tap water, which is usually drawn from either an above-ground body of water (like a reservoir), or an underground aquifer. Both are subject to contamination, so tap water is usually disinfected with chlorine which inhibits the uptake of nutrients, reducing plant growth and health. Most tap water is also treated with fluoride and contains traces of agricultural chemicals and pharmaceuticals, which may be absorbed into the edible portions of some plants. And if your tap water is ‘hard’, it contains a lot of dissolved minerals, especially calcium, which can build up in the soil over time leaving a residue that is hard on plants. Rainwater, on the other hand, isn’t treated, is naturally soft, and contains nitrate - an important fertilizer for your plants. Rainwater is also slightly acidic, which plants love, while tap water is made more alkaline to protect plumbing. And if you harvest your water from your roof it will contain traces of organic materials (like leaf litter, bird droppings, etc.) which are great fertilizer. In other words, rainwater that you harvest yourself is fully alive and designed by nature to support your plants! Many gardeners find it is much easier to keep plants alive and thriving when watering with rainwater.